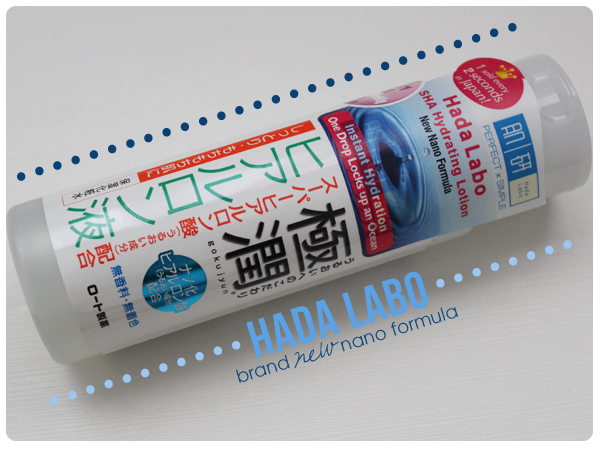 Hada Labo is one of my favourite brands and I have got bottles of it in my stash for 'rainy days' (Yes, I'm a big-time hoarder. Mum says I can set up my own Watsons. Haha.). 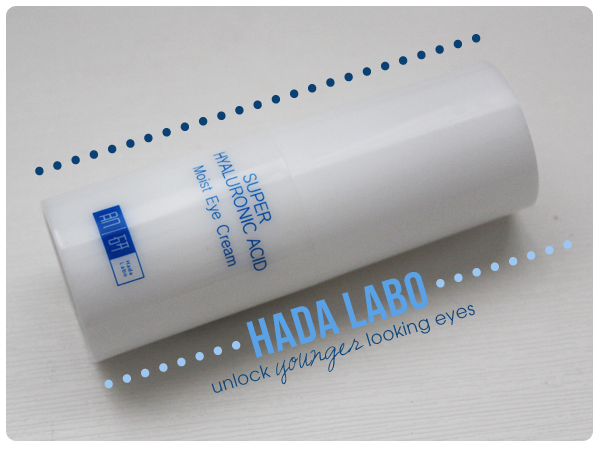 Anyway, dearest Hada Labo released 2 new babies recently, the Hada Labo Super Hyaluronic Acid Moisturizing Eye Cream and Hada Labo Super Hyaluronic Acid Hydrating Lotion! Nano Hyaluronic Acid: This acid's molecules are 1/20 the size of the normal Hyaluronic Acid, allowing a deeper penetration within the skin. Super Hyaluronic Acid: This acid contains a moisture retention capacity that is 2 times more than the normal Hyaluronic Acid. This helps to keep the skin hydrated and smoother for a longer time. Hyaluronic Acid: 1gm of this acid is able to hold 6 litres of water and so, it effectively locks in the moisture in your skin. 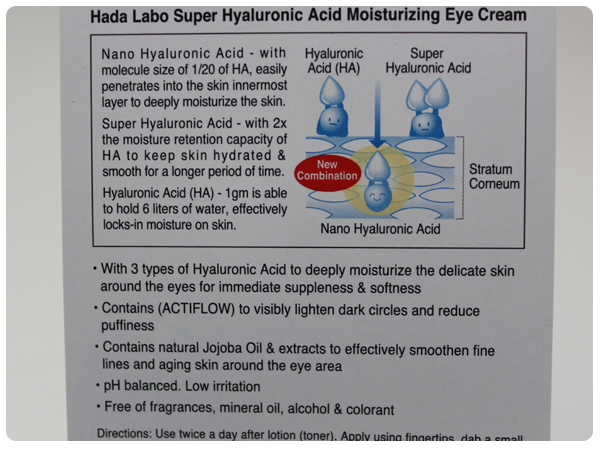 Besides the 3 aforementioned acids, Hada Labo Super Hyaluronic Acid Moisturizing Eye Cream also contains Actiflow to increase blood circulation and visibly lighten dark circles and reduce puffiness. Jojoba Oil is added to erase fine lines and smooth aging skin around the eye areas. 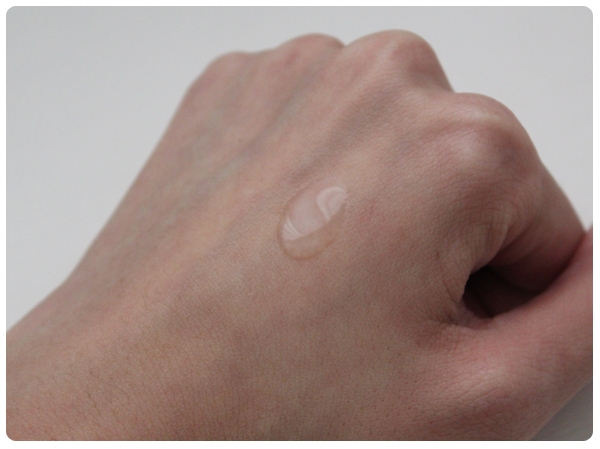 The cream is to be used after lotion or toner. Pump an adequate amount and dab it round the eye areas with your fingertips. The cream comes in a 15g white pump bottle. There is no direct contact with the cream so contamination is eliminated. Half a pump is all that you need for one eye as a little of the cream goes a long way. I like to dot the cream round my eyes first before patting it in. The cream feels very much like the Super Hyaluronic Acid Hydrating Milk, though it seems to sink into the skin a lot faster. I reckon this is due to the addition of the Nano Hyaluronic Acid. A slight 'oiliness' remains on the skin but it is less evident in the morning. My dark circles aren't very obvious in the first place, so I can't comment on that. But the areas round my eyes are certainly more hydated and the lines under my right eye are not as deep as before. 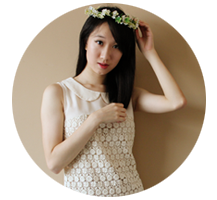 Also, I noticed that my eyelids are more even nowadays. I'm not sure if it's because I'm getting more sleep or this cream is actually magic. School is starting soon, so you can bet that I'll be scrutinizing my eyes! 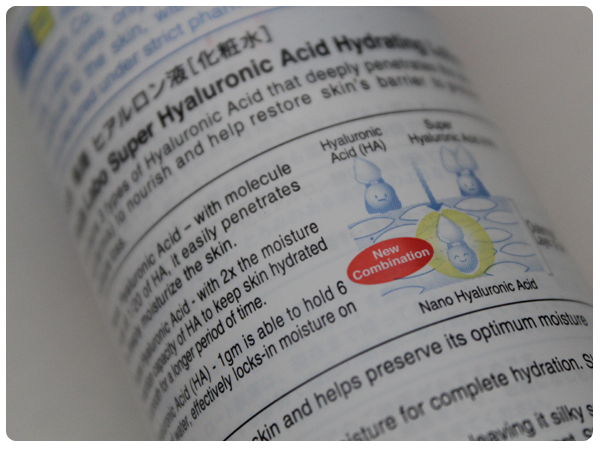 The Hada Labo Super Hyaluronic Acid Hydrating Lotion is like my beauty soulmate. Haha. I reviewed the old version here and waxed lyrical about it. The new one can only be better, right? RIGHT!! But before I start rambling, do remember to pat the lotion into your skin! Applying the lotion in circular motions does nothing. Pat it in! The packaging of the lotion did not change. It still comes in a 170ml bottle with a opening at the top, from which you can pour the lotion out. Hygiene is completely taken care off. I apply the lotion in layers; pouring a little of it on one palm, using my other to pat it in slowly and then, repeat. The lotion feels lighter than the old one and just like the cream, it seems to absorb a lot faster! Thank you Above for the invention of the Nano Hyaluronic Acid! As the lotion sinks into the skin faster, the slight 'oiliness' that remains is lighter than what you got with the old one. Previously, I used the lotion only at night but with the new formula, I find that it is comfortable for me to use it in the day, under my makeup. 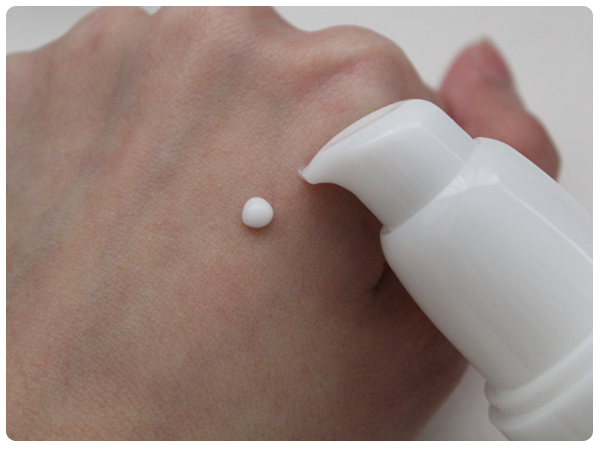 Hyaluronic acid cream supplies the skin with the needed moisture in addition to preventing scarring and wrinkles. One of the main ways that it does this relates to how it provides the skin with water retention while additionally stimulating the production of elastin and collagen.